This rich, buttery, creamy chicken needs no introduction. 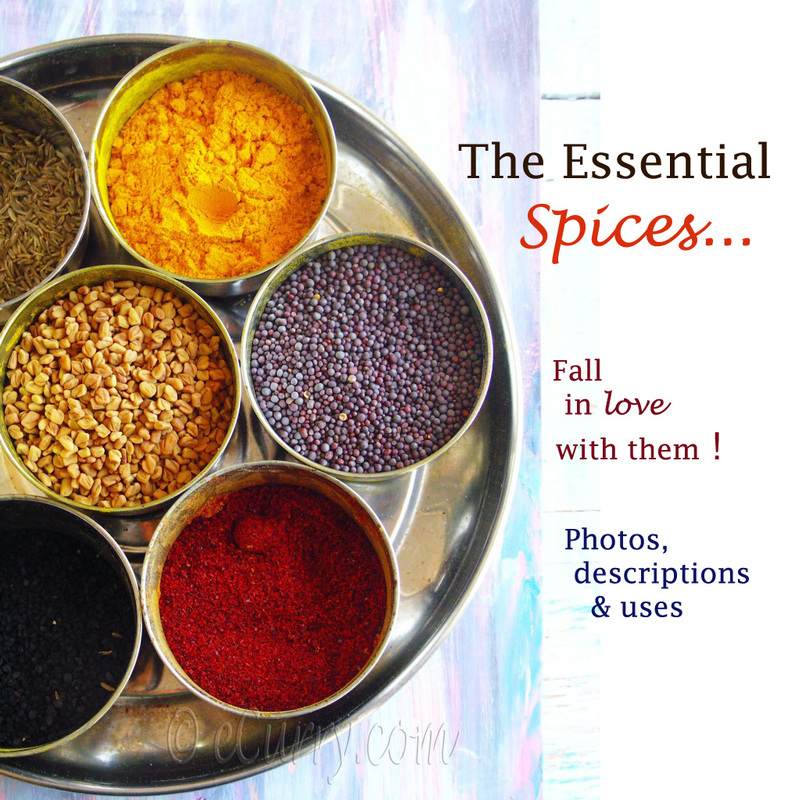 Most probably the best known of all Indian dishes, it has already claimed the fame that it deserves. 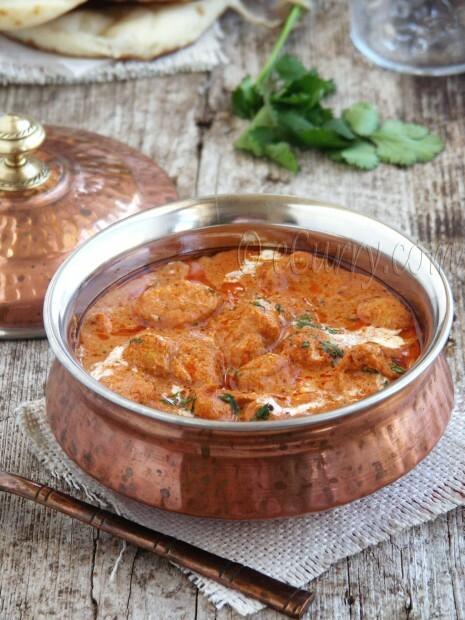 There are many who know not where India is, but is well aware of the culinary map; there is an instant spark and recognition at the utterance of “Butter Chicken”. Such is the magic of gastronomy. Food makes the world smaller and friendlier, provides a base for conversation between two people who might have nothing in common. There are not many Indian restaurants that do not serve Butter Chicken. 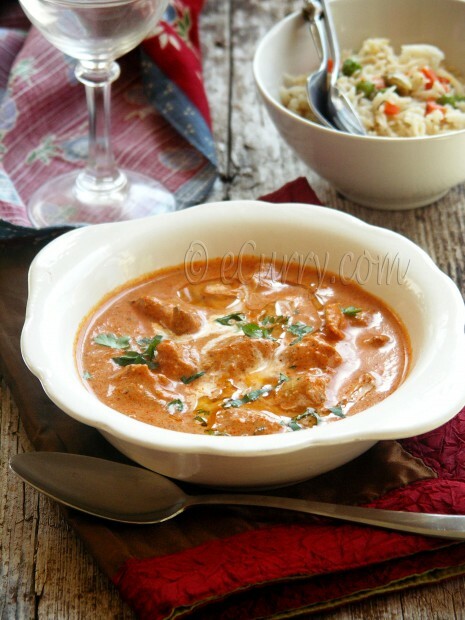 In our home, Murgh Makhani served in the restaurants is also a measuring tool to judge the quality of the restaurant. If a restaurant cannot whip up a good Murgh Makhani, the kind that will leave you stuffed and satisfied yet craving for more, that restaurant is not worth stepping into the second time around. 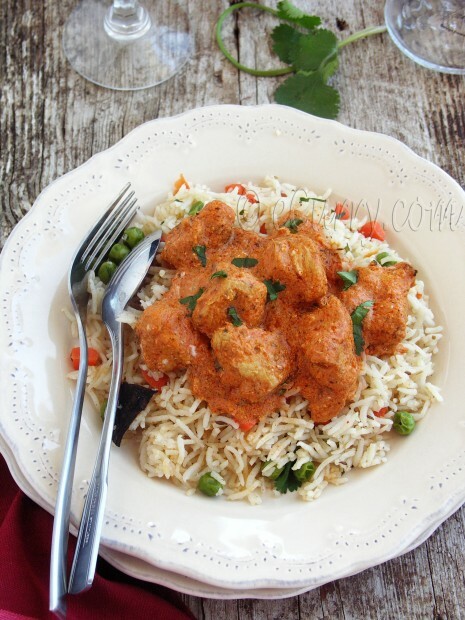 Murgh Makhani is not the same thing as the Chicken Tikka Masala,; both the recipes look similar and uses marinated grilled chicken in the sauce, but the base sauce for the two recipes are quite different. 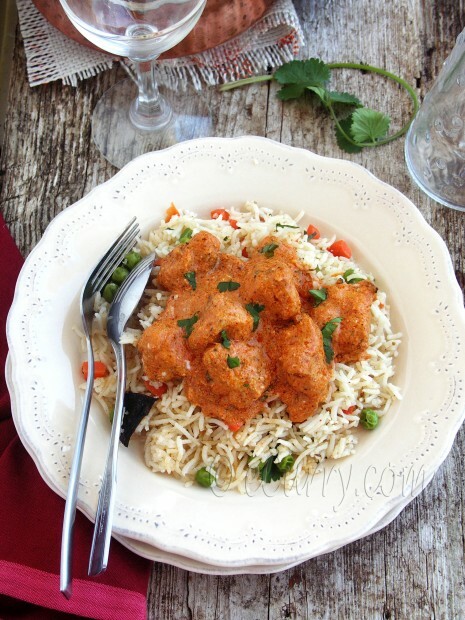 While the Chicken Tikka Masala is told to have been created from the Cambell Tomato Soup, the sauce for Butter Chicken is made with pureed juicy tomatoes, and spices cooked in butter, and is finished off with fresh cream. The primary aroma of the dish unfolds with the addition of the kasuri methi/dried fenugreek leaves. The trick is to cook the chicken in a tandoor/traditional clay oven, where the temperature reaches way higher than any regular oven; the marinated chicken is cooked in few minutes, tender and succulent. 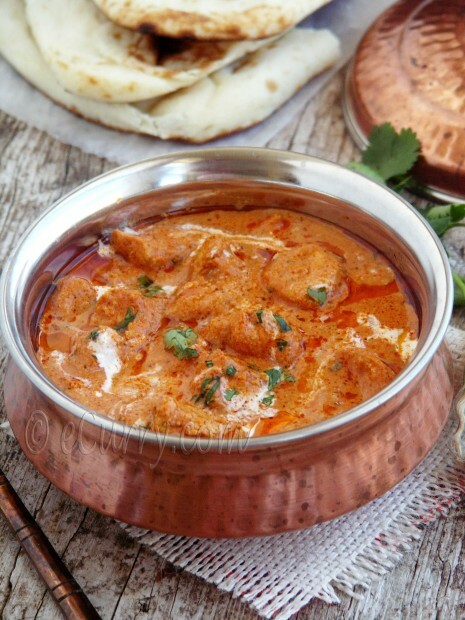 Butter Chicken is a rich regal dish, and that is what the talk is all about. This in its authentic form has given it the popularity it achieved. There are many who gasp at the amount of cream that goes in it. So there are a lot of versions that substitutes the cream with yogurt or the butter/ghee with oil. I have tried those kinds too, but they have failed to fulfill me. 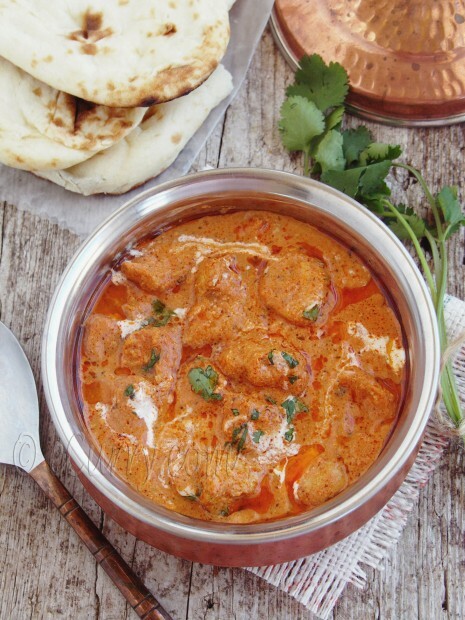 Substitutions make nice chicken curries, but not the Butter Chicken. So when I make Murgh Makhani, and which does not happen everyday, I do indulge and make the rich original kind. 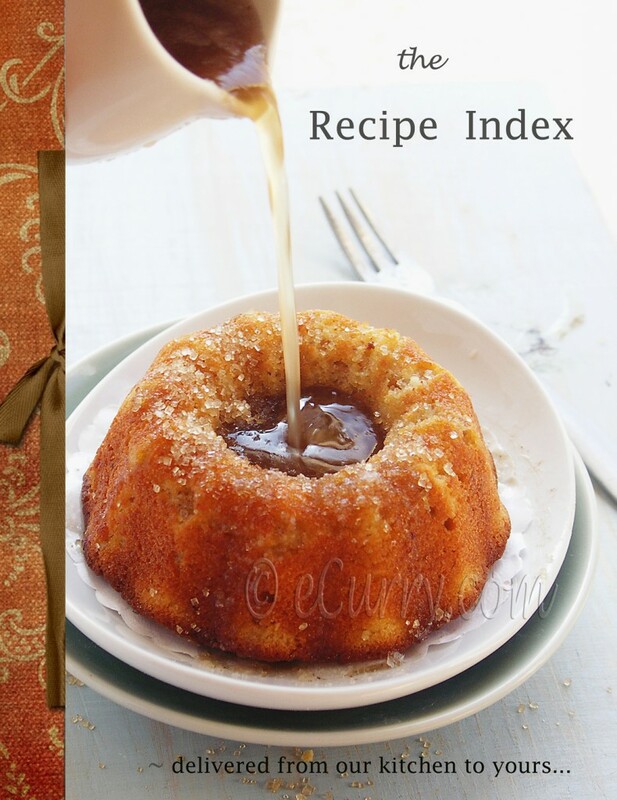 If you do need to substitute the cream, use half and half or evaporated milk or even milk. The taste of the final dish stays closer to the original. **Note on the grilled chicken: you may use the recipe above or if you already have the Murgh/Chicken Tikka (recipe posted) ready, you can use the same chicken in the sauce. 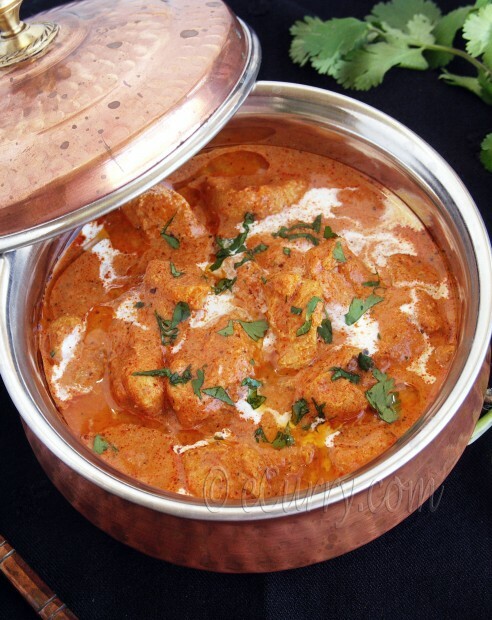 Note on the Sauce: You can make the sauce right when you are making this dish (use recipe below) or use 2 cups of the Makhani Masala (without the cream added to it) if you have it already frozen and stored. 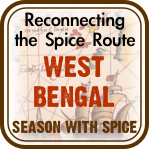 Whatever you use, pre made/frozen or make it now, use 2 cups of the Sauce/Makhani Masala. If you are making now as per the recipe below and have extra, freeze it for later use. Apply red chili powder, lemon juice and salt to the chicken and set aside for 20 minutes. This is the first marination. 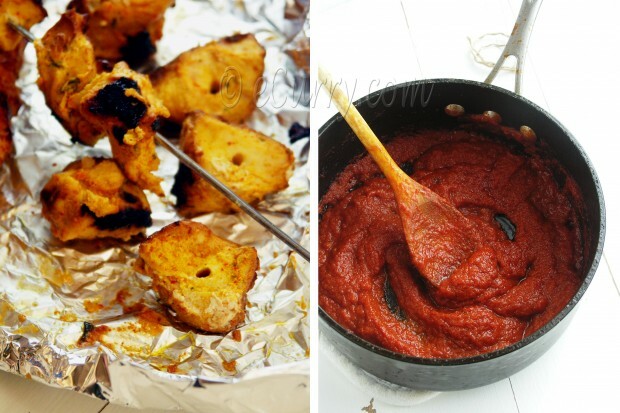 Combine all ingredients of the second marinade (see ingredient list). Apply this marinade to the chicken and refrigerate for three to four hours; overnight works better. Put the chicken on skewers and cook on a grill or a preheated oven at 400°F, for about 10 minutes while turning them over mid way. Cook until done. Do not overcook, as the chicken will dry out and get fibrous. Baste it with butter/ghee/oil or marinade if you want, a couple of times while cooking. Set aside once done. Heat butter/ghee or oil in a thick bottomed pan. Add green cardamoms, black cardamom, cloves and cinnamon. Sauté for a couple of minutes or till they start to sizzle and get fragrant; add the methi/fenugrek seeds. 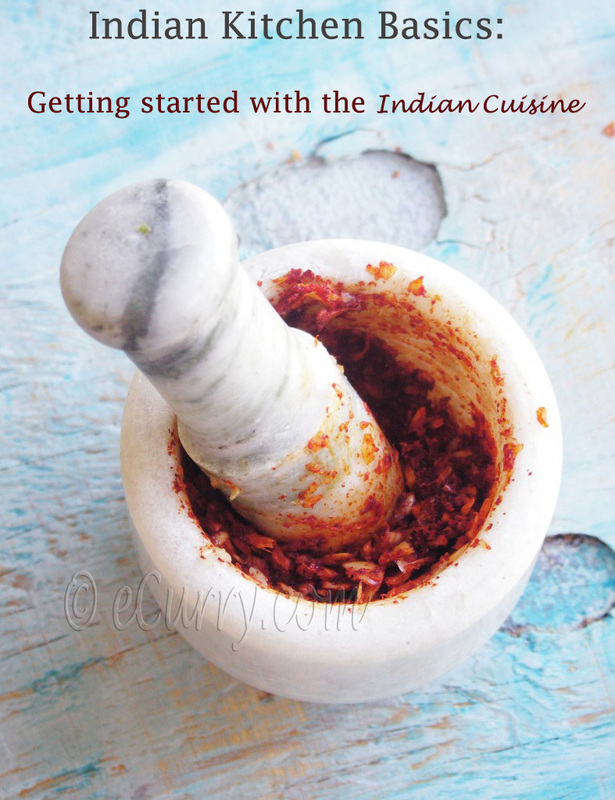 When the methi seeds sizzle, add ginger paste and garlic paste, and the slit green chillies. Cook in medium heat for five to eight minutes; the water from the paste would have evaporated and the ginger garlic paste would have reduced in quantity. Add tomato puree or paste, red chili powder, and salt. Cook (may partially cover during cooking) at medium heat for about 15 – 20 minutes. The puree will reduce to a thick paste and the oil/ghee will separate from the sides of the pan. After the tomatoes are cooked down, you might want to blend the cooked sauce (along with all the spices) into a smooth puree, if you want a restaurant like smooth texture for the sauce – especially if you are using fresh tomatoes. return it back to the pan after blending and continue with the rest of the process. Add 2.5 cups of hot water to the pan (or if you want it less soupy and want the sauce to kind of coat the chicken pieces and have a little bit extra, add less water or simmer for longer time to achieve the pref. consistency as per your taste), add the almond paste and bring to a boil. Reduce heat and simmer for about 15 minutes; add sugar and crushed kasuri methi. Add cooked grilled chicken pieces. Stir well to combine – the chicken will be well coated with the sauce. Cover and simmer for eight to ten minutes; Lower the heat and add garam masala and the heavy cream. Stir in the cream and simmer at low heat for about five more minutes. Garnish with fresh cilantro and add a splash of cream before serving. or with Naan or Parathas. 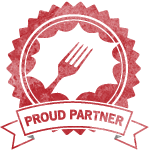 March 5th, 2011 | Category: Curries, Main, Entrees etc, Meat & Poultry, Sides & etc.